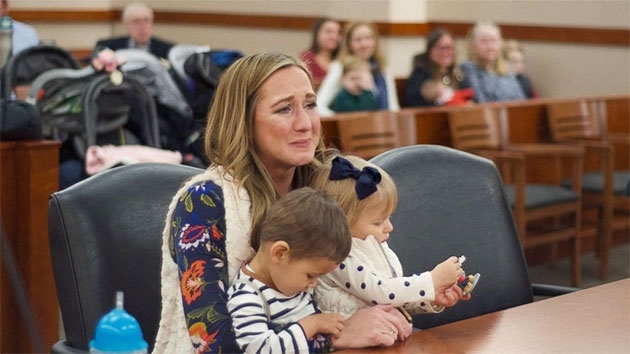 A single mother received the surprise of her life after discovering that the baby girl she was about to adopt shared the same biological mother as her newly adopted son. (NEW YORK) — A single mother received the surprise of her life after discovering that the baby girl she was about to adopt shared the same biological mother as her newly adopted son. Page divorced in her early 30s before becoming a foster parent in 2016. During her marriage, she experienced issues with infertility but had dreams of being a mom, she said. “It was on my bucket list and I also always wanted to adopt,” Page added. Page cared for four foster children before meeting Grayson — a baby boy who was abandoned at the hospital. On May 25, 2017, Page officially adopted Grayson, who is now 2 years old. A month after Page adopted Grayson, she received a call about a newborn girl, named Hannah, who needed a home. Page said as soon as she met Hannah, now a year old, that she knew she wanted to give her a forever home as well. But when Page brought Hannah home and saw the name of the biological mother on the hospital bracelet, she noticed a similarity. Page said it was unclear whether or not Grayson and Hannah were brother and sister because their mother had lied about her last name and date of birth when she left Grayson at the hospital on the day he was born. Both children had been exposed to methamphetamines in the womb, according to Page. Page’s roommate, Ashley Chapa, was present as she began unfolding the mystery. On Dec. 28, 2018, Page officially adopted Hannah. Months prior, Page had a DNA test done on the children that confirmed them to be biological siblings, she said. Page hopes to adopt Grayson and Hannah’s 5-month-old sibling this year, she said.